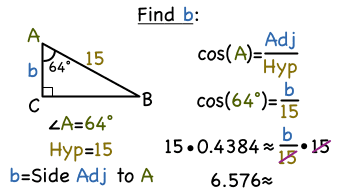 The cosine ratio is not only used to identify a ratio between two sides of a right triangle, but it can also be used to find a missing side length. This tutorial shows you how to use the cosine ratio to find that missing measurement! The sine ratio is not only used to identify a ratio between two sides of a right triangle, but it can also be used to find a missing side length. This tutorial shows you how to use the sine ratio to find that missing measurement! The tangent ratio is not only used to identify a ratio between two sides of a right triangle, but it can also be used to find a missing side length. This tutorial shows you how to use the tangent ratio to find that missing measurement!